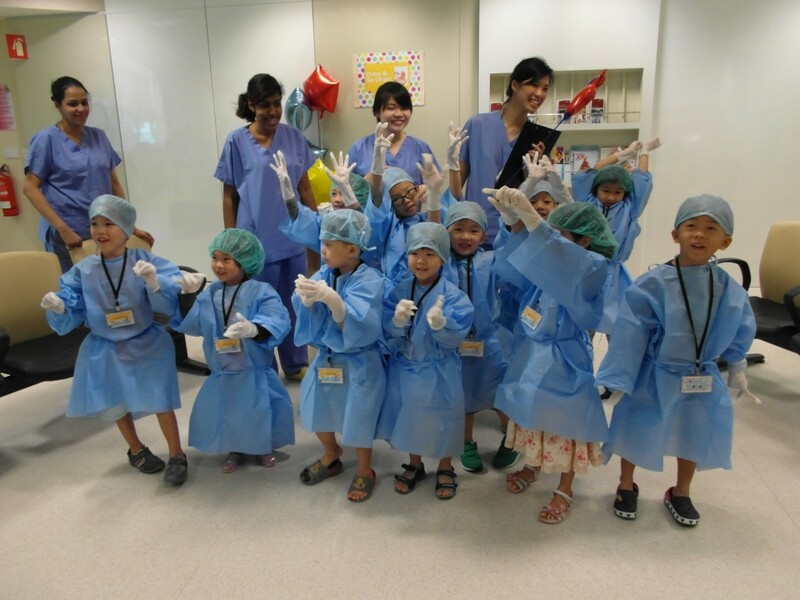 If not for a tip off by a friend, I would have never known about this event organized by theÂ National Dental Centre of Singapore (NDCS)Â Paediatric Dentistry Department in conjunction with their NDCS Paediatric Dentistry Facebook page‘sÂ 1st anniversary. 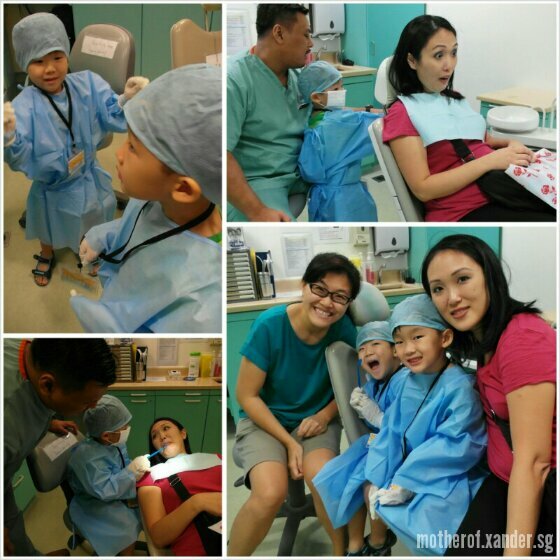 Xander has yet to visit a dentist at this point because like many parents, since we haven’t had any problems with his teeth, we didn’t think of bringing him to the dentist. 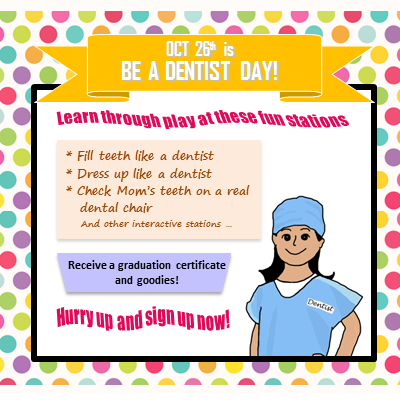 My first thought when I saw this was that this would be a wonderful way to introduce to him what a dentist would do during a regular visit! Maybe by his appointment, he wouldn’t be so scared of dentists like I did when I was a kid. 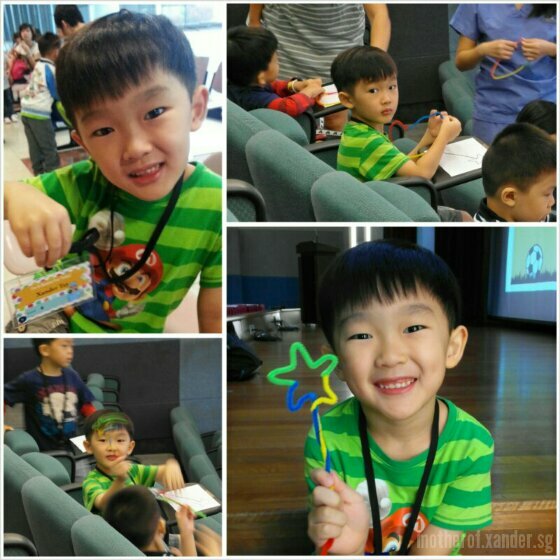 I had initially registered Xander and his cousin to attend the event but at the last moment, my nephew couldn’t make it soÂ Mary (Simply Lambchops)Â and her sonÂ came to my rescue and took over his spot for the session. Thanks Mary! 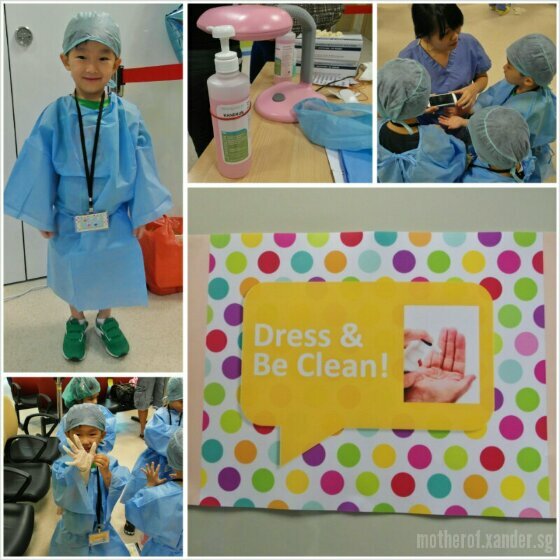 Similar to the Doctor for a Day event we attended in August, Be a Dentist Day also involves the children exploring several stations at the NDC where they were guided by the volunteers to try tasks like bending wires, filling cavities and how NOT to choke your mother to death whilst trying to inspect her mouth with a tiny mirror in her mouth. They also reminded the children what foods are bad or better for their teeth with some role play in their mock supermarket which was stocked with all sorts of food you would normally see in a real supermarket. You know ah, I didn’t understand what this particular station was about. Bend pipe cleaners for what ah? The young dentist didn’t explain very clearly at the beginning. It was much later that Mary found out from them that this exercise was part of their training in forming braces. Ohhh…. 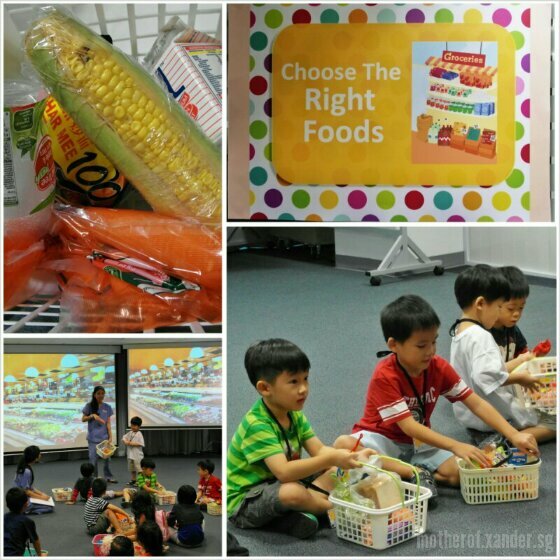 At this station, the children were asked to pick out food that they think is good for their teeth. Most of them just picked whatever they liked and at the end of the “shopping trip”, they were taught why certain foods are better than others. I thought the kids spent a little too much time at this station dressing up and cleaning hands. I wished the volunteers had asked the kids to demonstrate how they have been keeping themselves clean at home and at school so that whatever bad habits the kids had can be pointed out and discussed as part of the programme. Sometimes when mummies nag too much, kids kind of ‘switch off’ and stop listening so getting advise from strangers might be a little more convincing. I felt a little weird out when the young lady kept referring to the cavities as “the black black thing”. 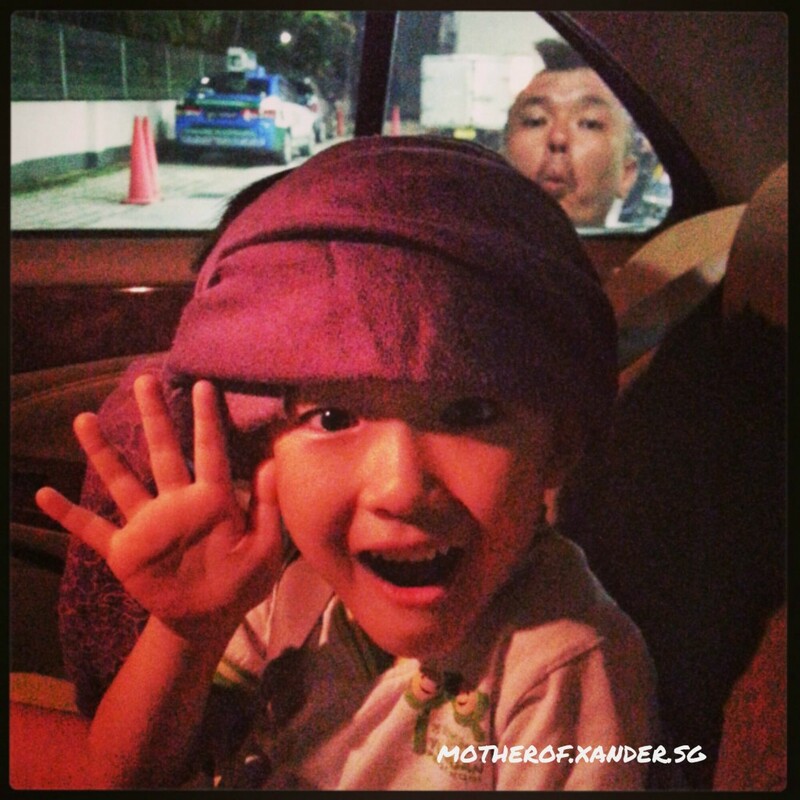 Why do folks like to baby-talk to kids ah? Cavities say cavities lah. It’s not a dirty word what. Sorry ah, I cannot tahan when seemingly educated young people like to talk like that and undermine kids. You really think the kids are stupid or wat? 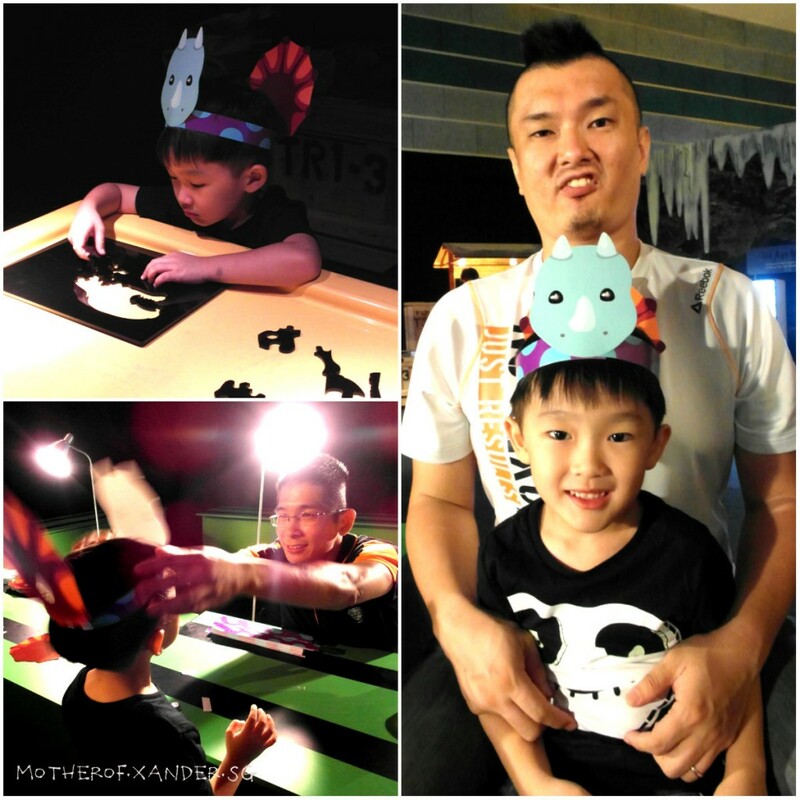 I think the experience as a whole was fun for the kids and the duration was just nice. Which kid doesn’t like to role play you tell me? 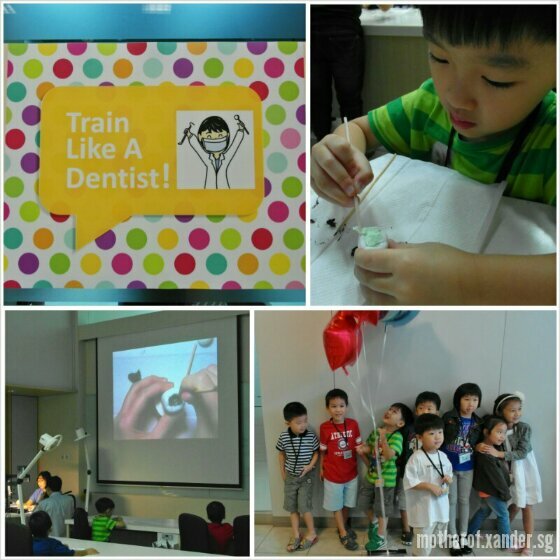 Do like the Paediatric Dentistry NDC’s Facebook PageÂ for updates on future events such as this. 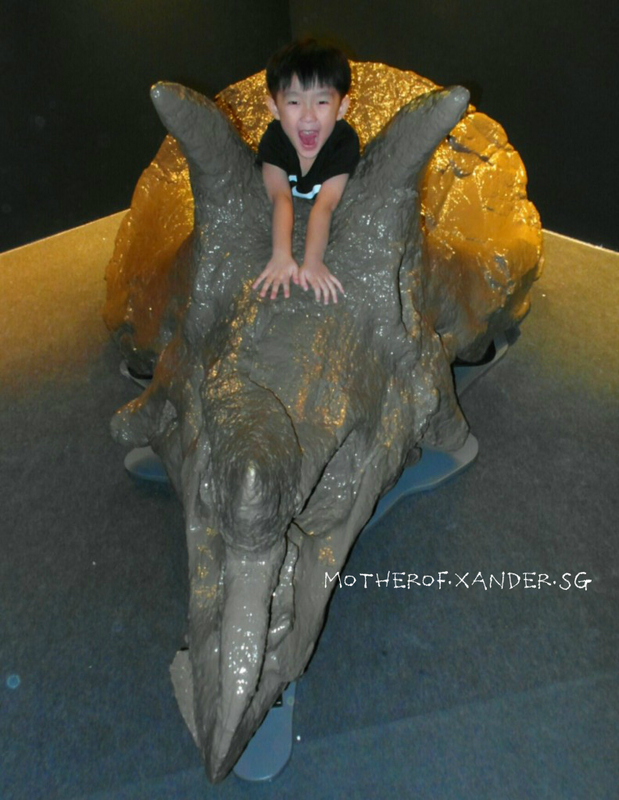 So, The BlogfatherÂ received an invitation to the launch of The Science Centre Singapore’s latest exciting exhibition, Titan of the Past earlier this month and asked me if Xan would be keen to see some dinosaurs. 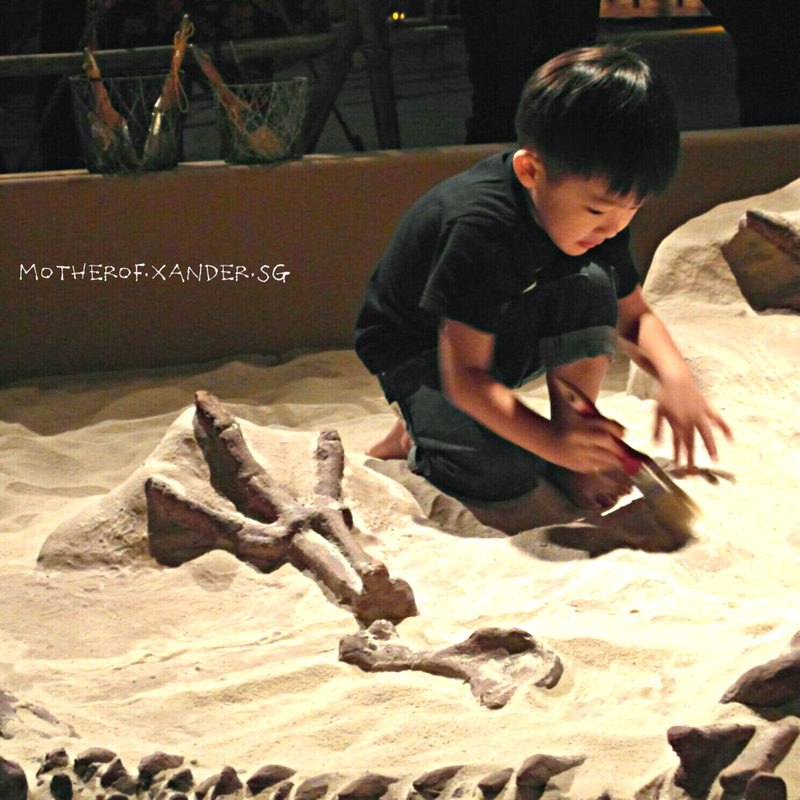 Prior to this, I already heard about the exhibition WEEKS beforehand and told myself I would go with or without the boys because I knew there were going to be real bones and fossils on display. Real ones leh! Wah! So without hesitation, I told The Husband we will go regardless of Xan’s preference. He can always hold my hand tighter or bury his face in my belly if he gets scared at any point in time. So mean hor? Oh well. 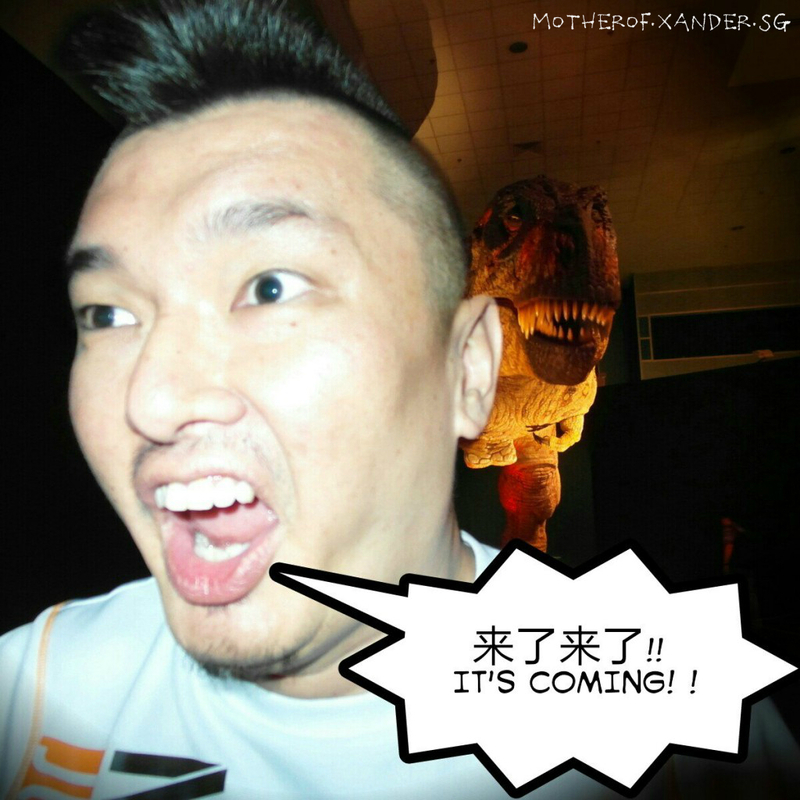 Man, I laughed until pengsan when I saw this! Ok back to the serious stuff. 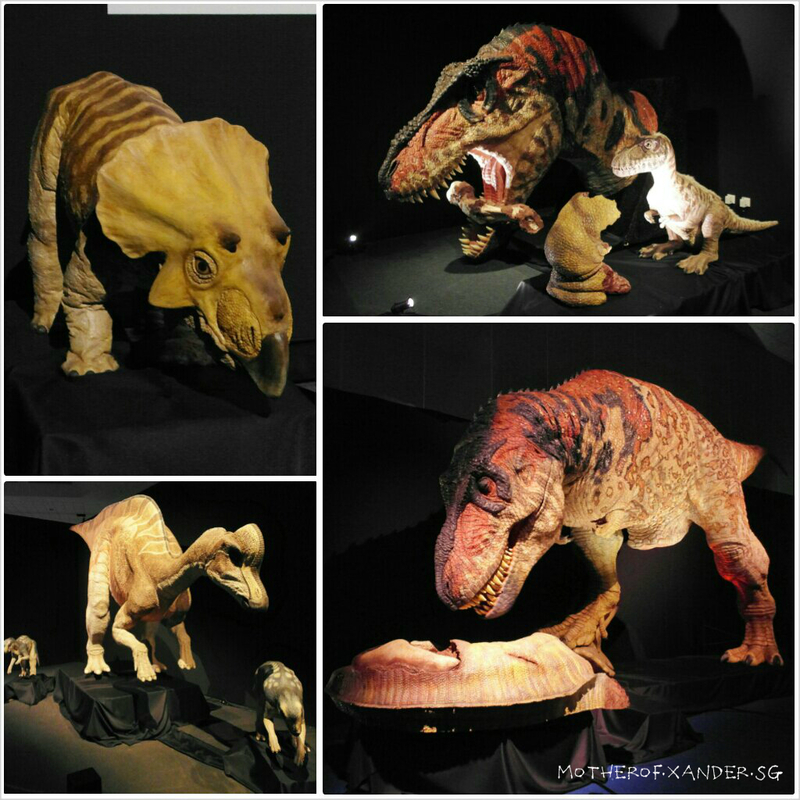 Titans of the PastÂ is a unique presentation put together for the very first time to form a seamless storyline of travelling through pre-historic times. The first segment, â€œThe Growth and Behaviour of Dinosaursâ€ is an exhibition from The Museum of the Rockies (MOR) in Montana, USA, with animatronics from Kokoro in Japan.Â The exhibition features the work of Dr Jack Horner, one of the worldâ€™s leading palaeontologists and consultant for Jurassic Park films, and his research team. 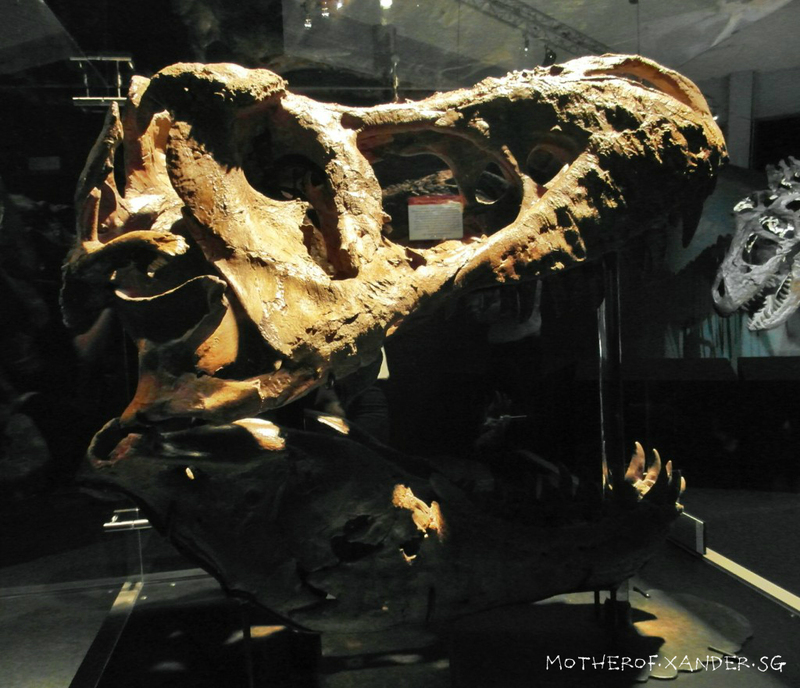 ItÂ showcasesÂ beautiful and valuableÂ realÂ fossils including theÂ largest T-Rex skull ever found, good-quality replicas, state-of-the art animatronics and a controversial story line. 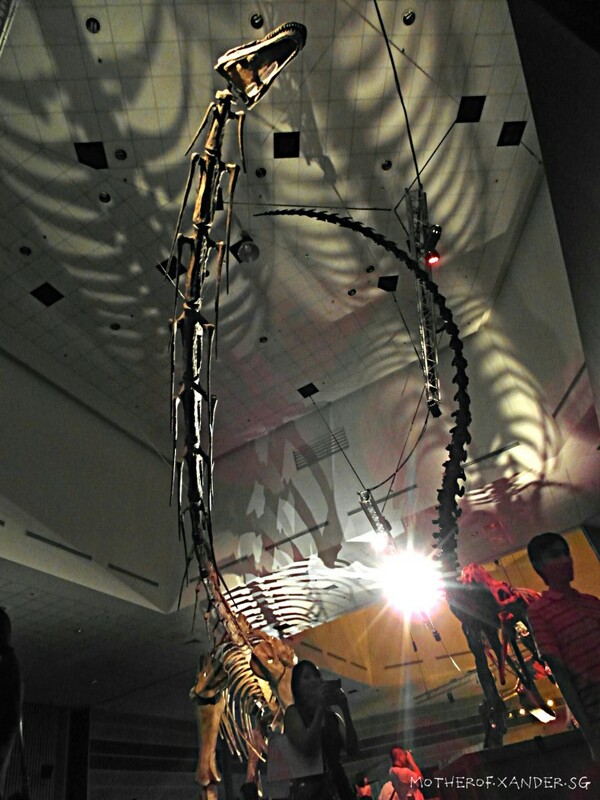 The second segment features life-sized dinosaur skeletal casts of the Argentinosaurus, measuring a majesticÂ 36m in length and 7m in height, a Giganotosaurus and a T-rex. 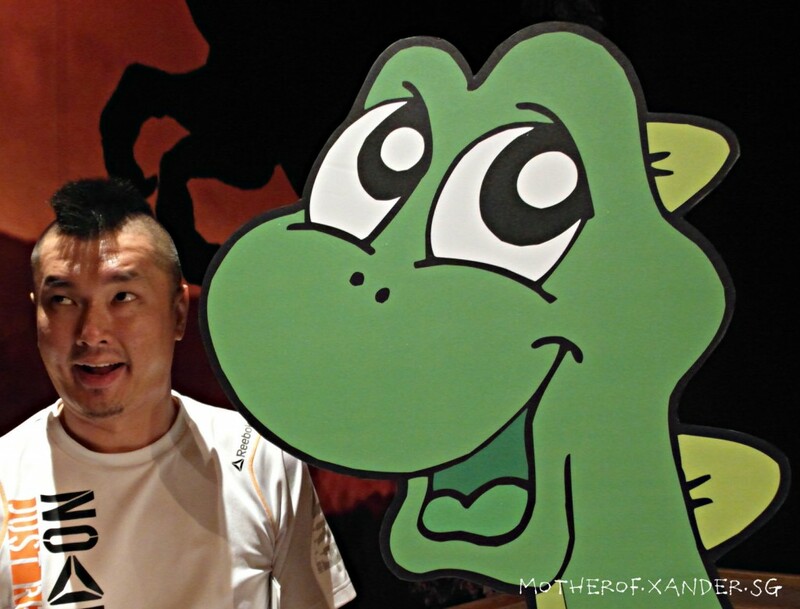 Animatronics from Japan. So real until scaredieme ah! Being the typical suaku city dweller I am, to be able to look at these skulls and fossils up-close was a pretty awesome experience for me. I think I already said so earlier right? Ya, that was how excited I was lah. TheÂ Argentinosaurus was so huge, it was almost impossible to take a decent photo of it in full. I lie flat on the floor also cannot take a proper photo leh. One of the downside about the exhibition I didn’t like was the lighting. You need to understand that I’m not young anymore. Eyesight also not as good as last time. The dim lights and small fonts are real killers for people with ‘old flower’ eyesight like me. Didn’t help that I am also a big barrel of a baby oven who can hardly bend over to read the signage without fearing I might not straighten out my back later. Â I hope the organizers can consider making it a tad bit brighter next time. 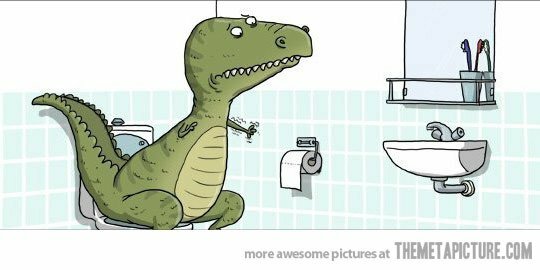 Ya, I hope there will be a next time PLUS more dinosaurs! I want the flying ones! 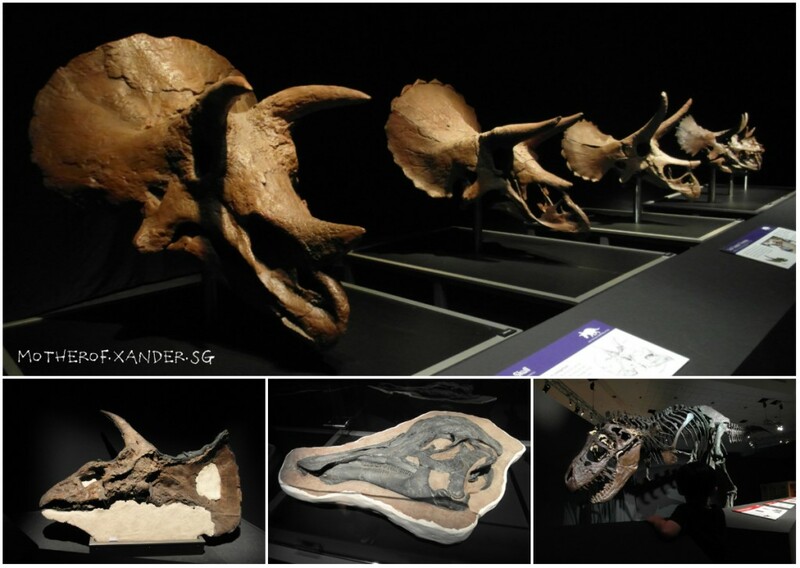 Fascinating reconstructed skulls of Triceratops and replicas of Hadrosaurid skulls. Argentinosaurus. This was the best shot I have of it. I want to bring this home! BAO BAO! What’s an exhibition without some kids’ activities? 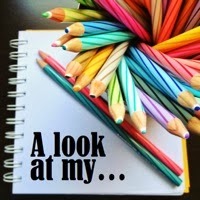 Overall, we really enjoyed ourselves tremendously staring at the exhibits and watching the movies. 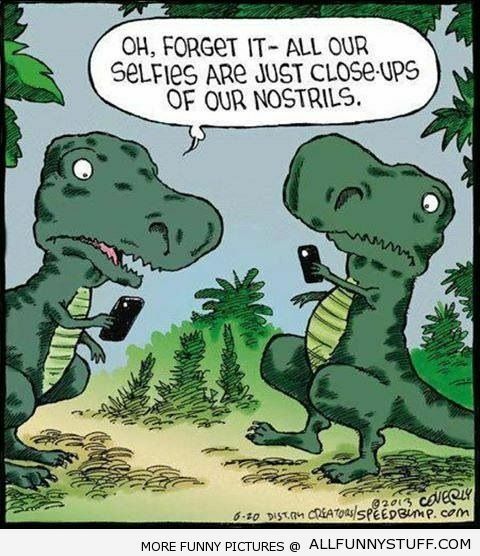 Come see, touch and take pictures with the dinosaurs! 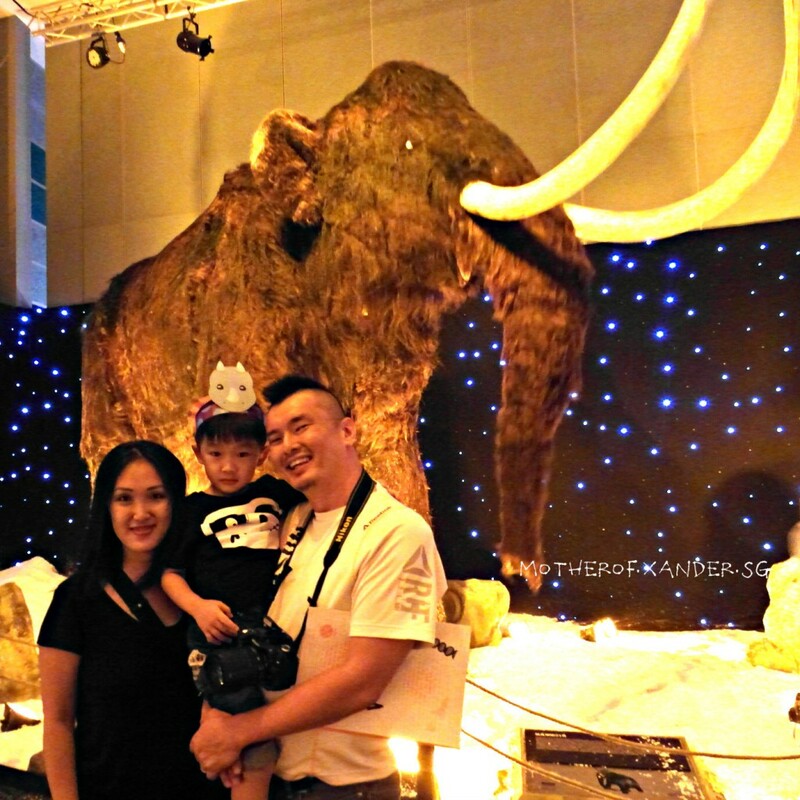 After that, you can also roam into Science Centre’s main halls to see their permanent exhibits. 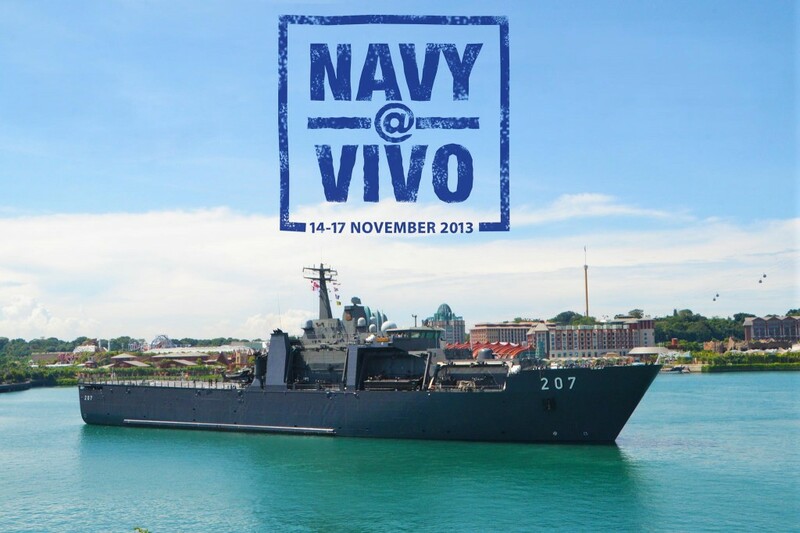 Earlier in November, I read that the RSS Endurance would be docked at the Vivocity’s Promenade from 14 to 17 November but admission into the ship was strictly by balloted tickets only so I fast leg fast hand went onto the Singapore Navy Facebook page and tried my luck for some. 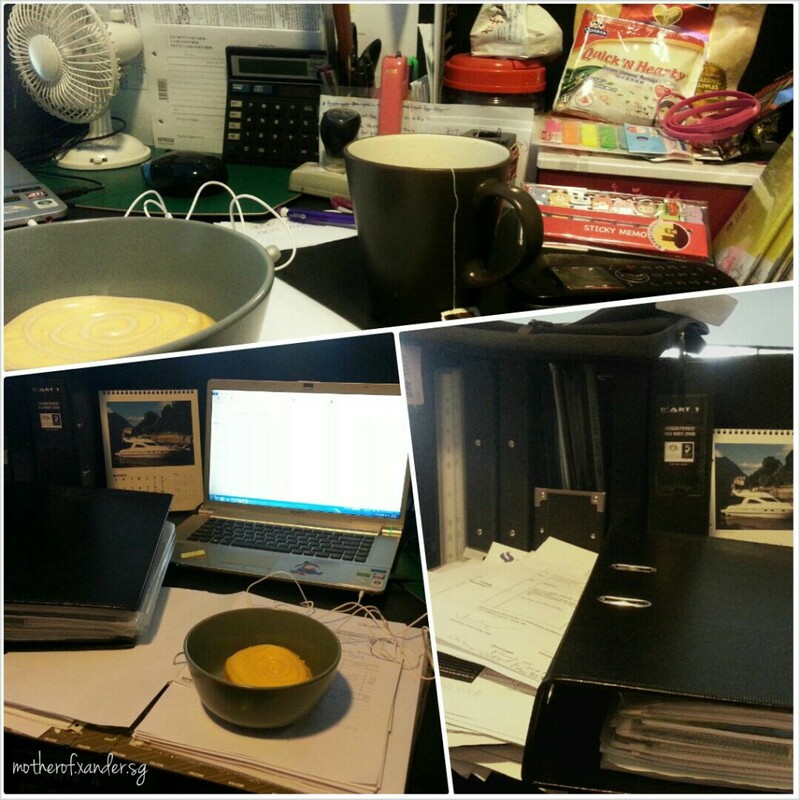 A couple of days later I received an email confirming that we were successful! 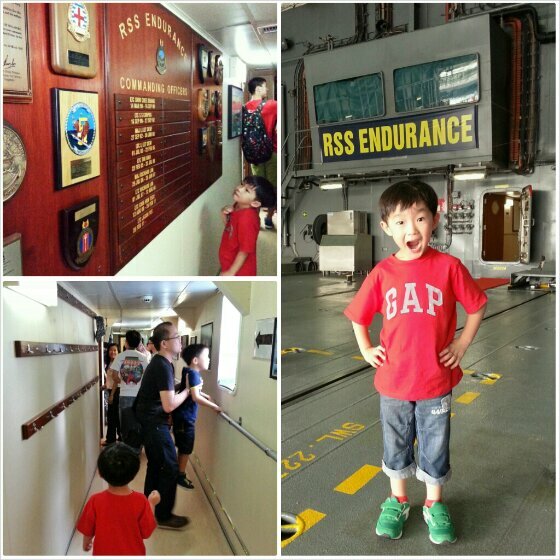 We were going on board the RSS ENDURANCE! Wheeee! What is this ship you may ask. 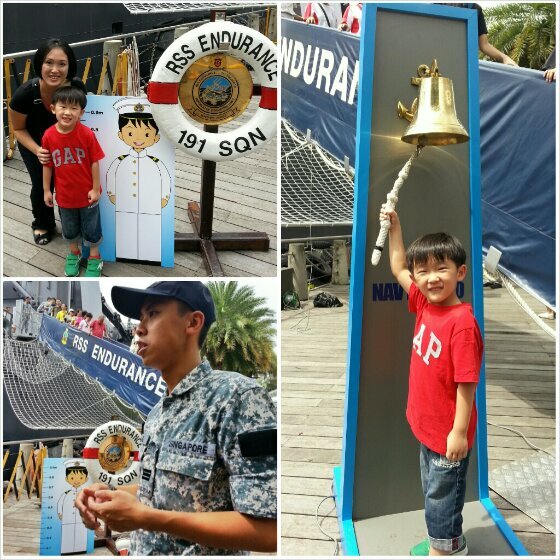 The RSS Endurance is the Republic of Singapore Navy’s largest ship and during the 4 day event, the Republic of Singapore Air Force’s Super Puma Helicopter would also be on the flight deck of the RSS Endurance for visitors to have a chance to see and of course, take pictures of. Some quick reminders before we board the warship. Just before we board the ship, the officer reminded us about the Three Point Contact Rule: The Three Point Rule requires three of four points of contact to be maintained at all times â€“ two hands and one foot, or both feet and one hand. The Republic of Singapore Air Force’s Super Puma Helicopter on the flight deck of the RSS Endurance. So we huffed and we puffed and we made it on board the RSS Endurance. First thing we saw was the hamson pilotÂ helicopter. Like a true suaku city-dweller I am, I let out a very loud WAHHHH! and dragged the poor boy to the aircraft to have a closer look. At the helicopter, not the pilot. 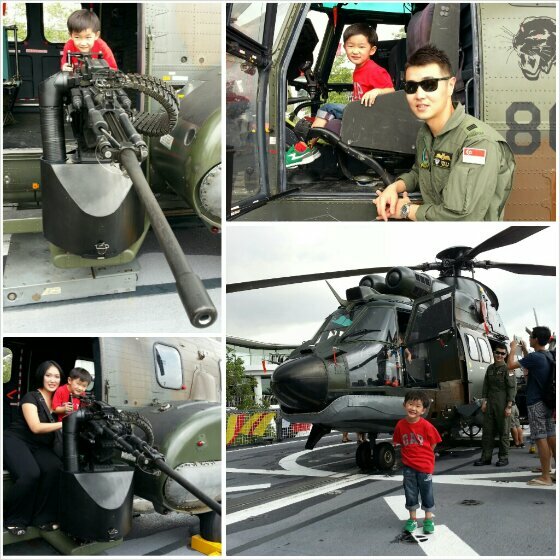 Xan was in awe of the helicopter. It was the first time he has ever seen one up close and he was a little intimidated. So intimidated that he didn’t realized 5 irritating people cut his line and rushed into the helicopter like true jerks. Poor boy. What can we do? 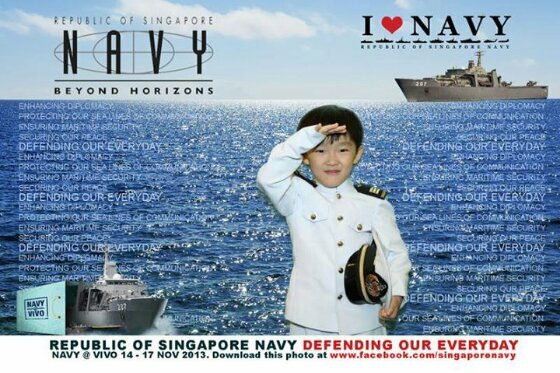 Wait for our turn patiently lor. We eventually got our turns and had a lot of fun posing for pictures anyway. It was surprisingly more spacious than I thought. We made our way into the belly of the ship and explored some of the sections that were made available for public viewing. In the control room looking so ‘sud kee’. Posing like a true child of a blogger. 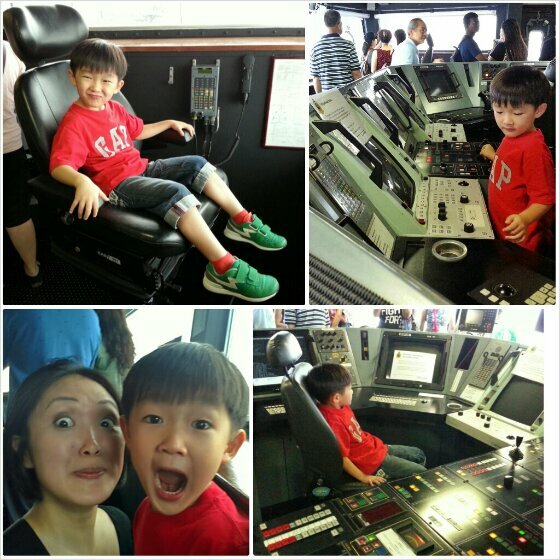 We had to miss the ride on the Fast Craft Utility (FCU) this time because pregnant women are not allowed on the craft. What a shame. Nair mind lah. We will definately try it if the opportunity arises again. 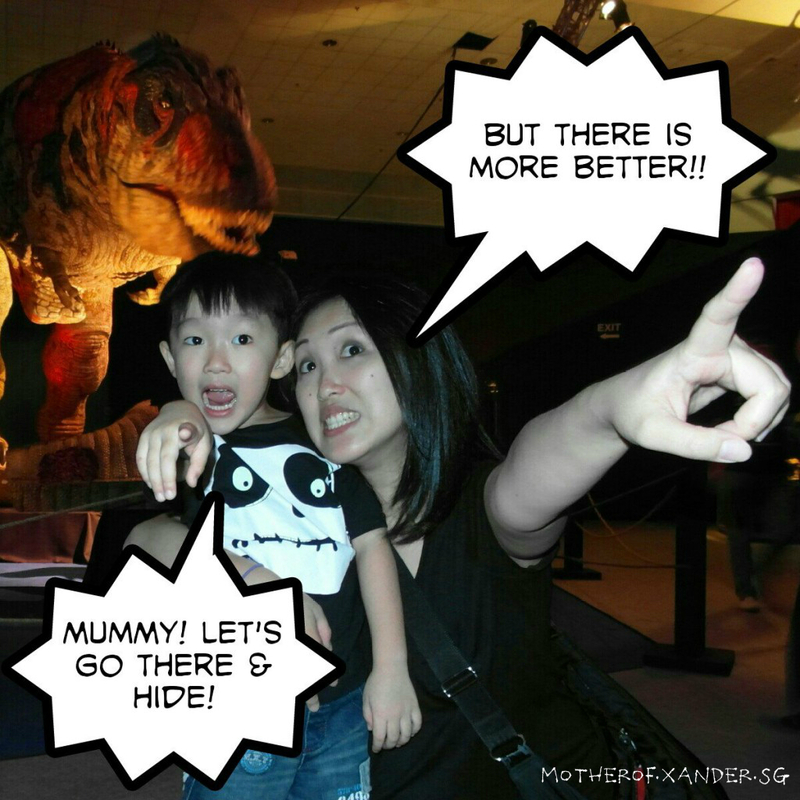 Perhaps better if Daddy goes with Xan than me since Mummy is afraid of everything. *rolleyes* According to The Husband, it’s really not that fast. He say for example to get to Pulau Ubin normally takes 40 mins, this FCU will take 20 mins. I was like *blink* catch no ball. Not that fast har? Ok lor. 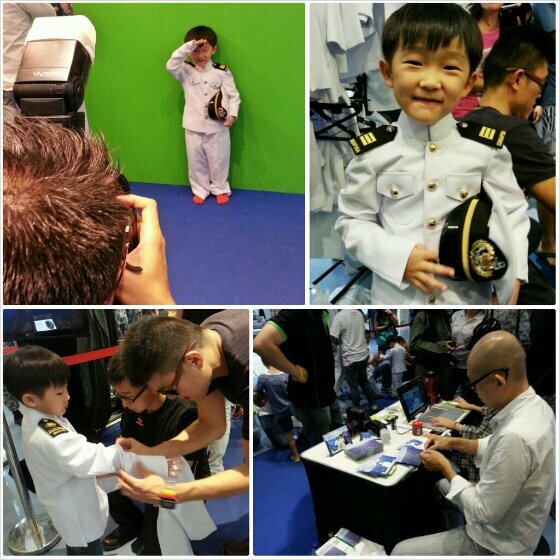 The tiny uniforms were so cute can?? 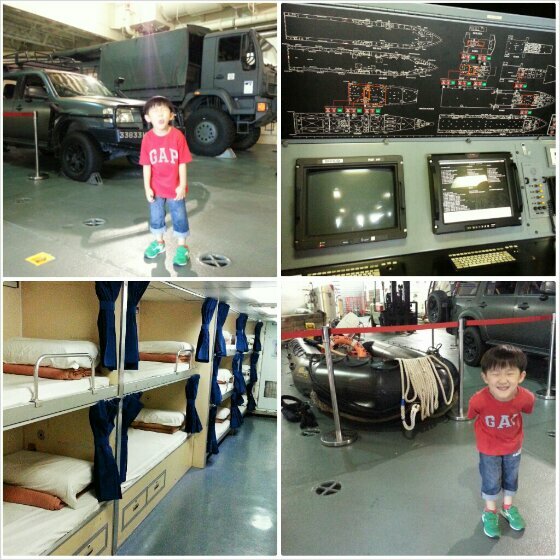 After the grand tour of the warship, we made our way to the exhibition area inside Vivocity hoping to learn more about the Navy. I will admit, I got distracted by the photo booth area and completely bypass most of the exhibits. Nair mind lah. There will be other times and when that happens we will see the exhibits again lor correct? Correct right? 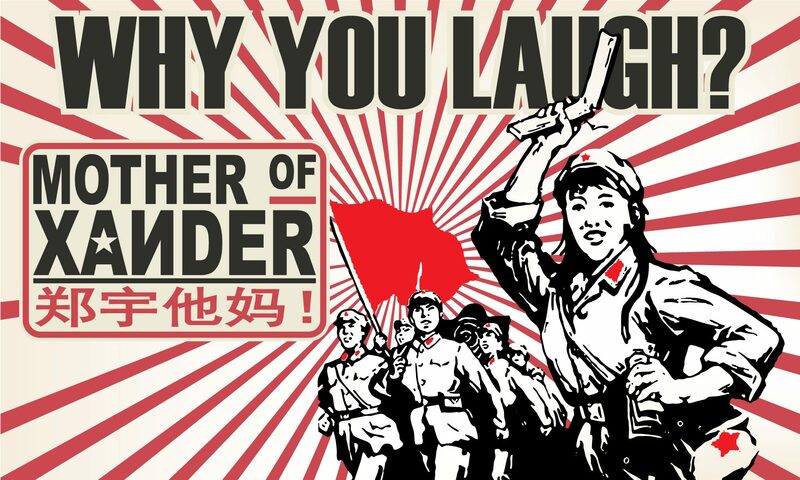 Ya, I also say. Not only did we get a printed copy of the photo, a softcopy of made it available on their Facebook page!While looking for Xan’s photo in their Facebook page, I came across some gems like this poor little fellaÂ and this one. You MUST see this precious one! I shouldn’t laugh at their misery but but but! SO CUTE!! SO POOR THING! Daddy was pumping air into the tires while the little one plays dress up with my shawl in the car. There is never a dull moment with these boys. I wonder how much crazier it will be when the baby arrives next year. 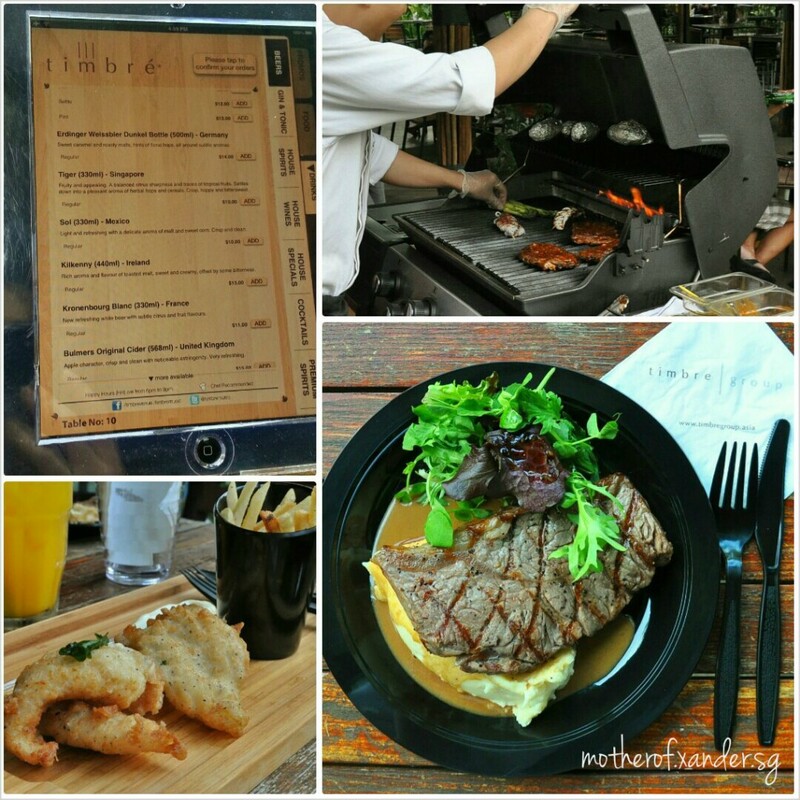 The Husband was invited to Timbre’s 1st Saturday Social BBQ last month. 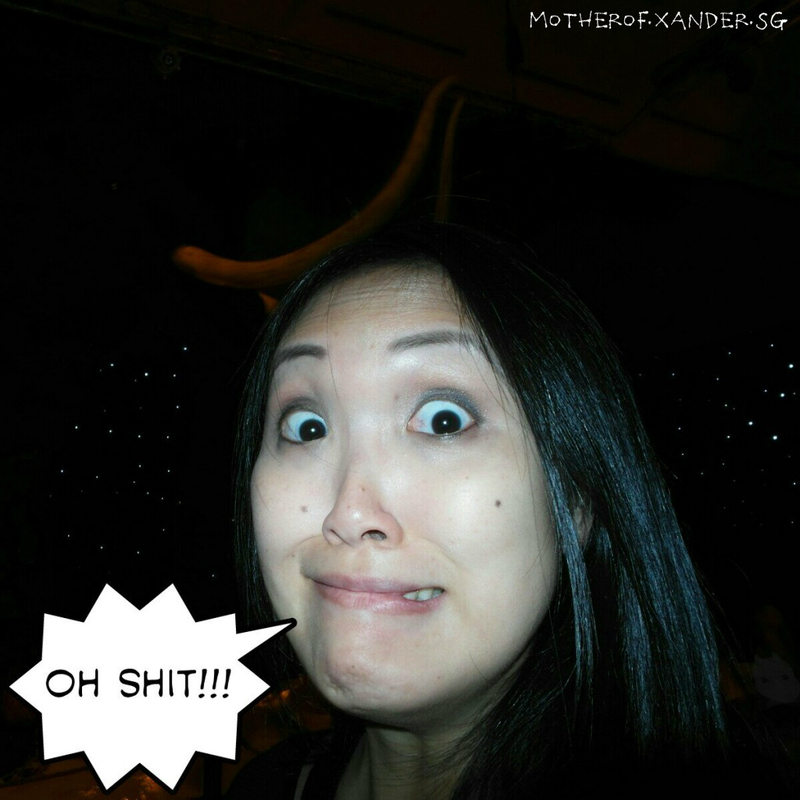 When he told me we were all going to Timbre for a BBQ dinner, I was like Har? Timbre? Isn’t Xan a bit young for the place? Do they even allow kids there? Did you misread the email or not? Well, it’s true. 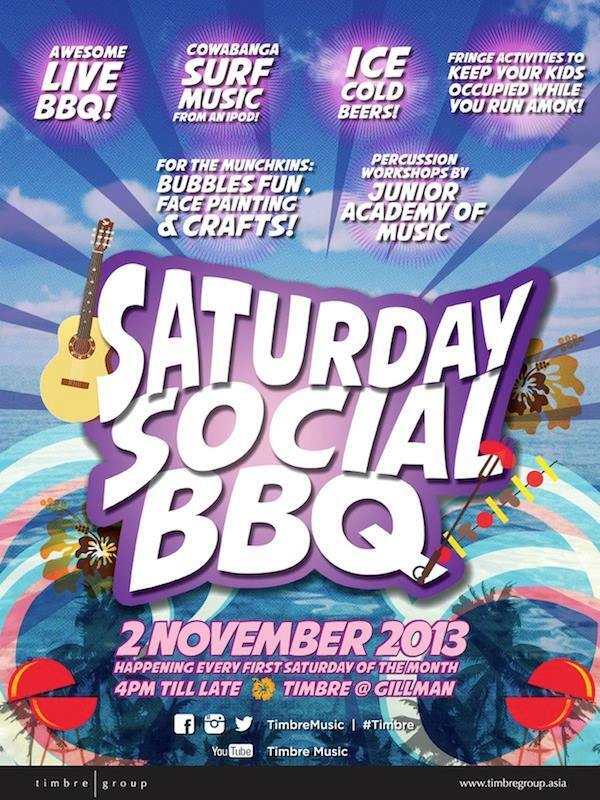 Timbre now hosts Saturday Social BBQ every 1st Saturday of the month. 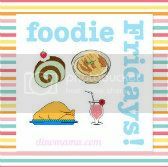 The event is geared at families with children and promises good food, good music and cool activities to entertain the little munchkins while you dig into your sirloin steak. Steak? Did someone say STEAK? Pardon my excitement. This hungry pregnant woman’s current constant craving is for steak. The Husband didn’t need to tell me more, I immediately marked the date off my calendar. Steak here we come! The menu came in the form of an iPad which you could order from directly instead of waving for the servers’ attention. So high tech eh? They had something for everyone on the menu and the list of alcohol variety wasn’t too shabby either. But then, please hor. If you drive, don’t drink. If you drink, don’t drive ah? There were plenty of craft activities for the kids. Erm, if you want to join in also can lah. 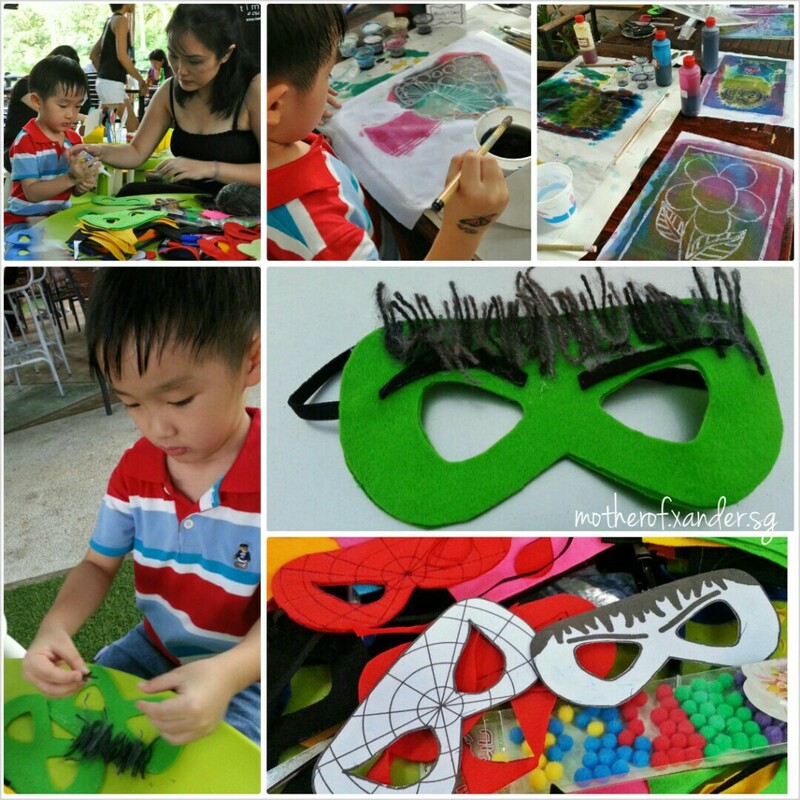 There were face painting, batik painting and mask making. For the teeny tiny tots, there were colouring activities and pots of bubbles for them to play as well. 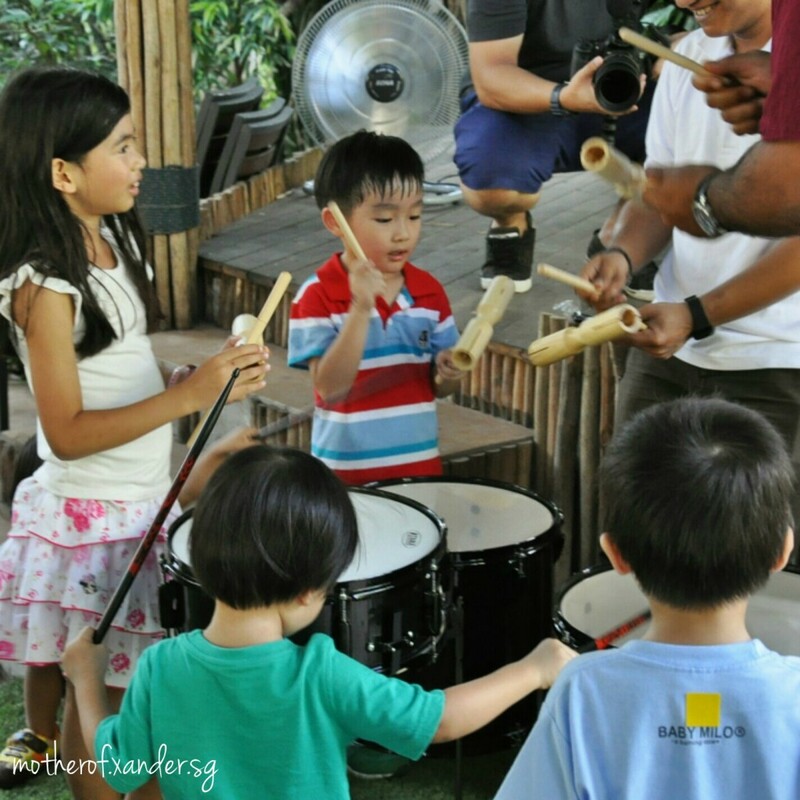 Other than the craft activities, the nice folks from Junior Academy of Music (JAM) brought along some percussion instruments for the kids to play with. They specialize in music classes for kids 5 to 12 years old. 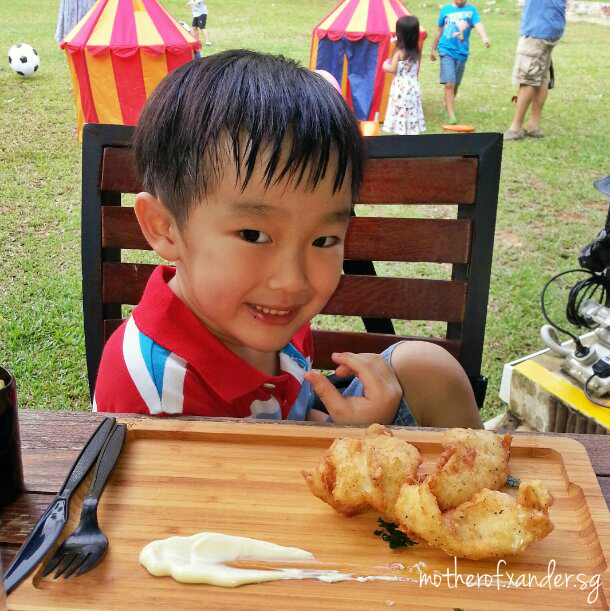 Unlike many al fresco restaurants in Singapore, there is a big open field right next to the dining area which the organizers set up little tents, tunnels and other toys for the kids to play with. After barely 10 minutes, Xan was a complete sweaty mess with grass and dirt all over him. Aiyoh! But he had a lot of fun playing with his new friends. So much fun until he didn’t want his fish and chips (they were very very good by the way). See his picture below? Couldn’t even sit still. Sigh! I do however have some concerns about the outdoor area. Being the city folks we are, the mozzies bothered me a bit. Note to all who would like to pay a visit there, bring your sprays, patches, whatever. I was a buffet spread for the mozzies. 🙁 I was also surprised to see the sides of the field not blocked off by anything. Beyond the edge of the field was a drop to nowhere and that posed a safety concern for me because we all know how kids play. When they get all excited, they will run without looking where they go. Scary. 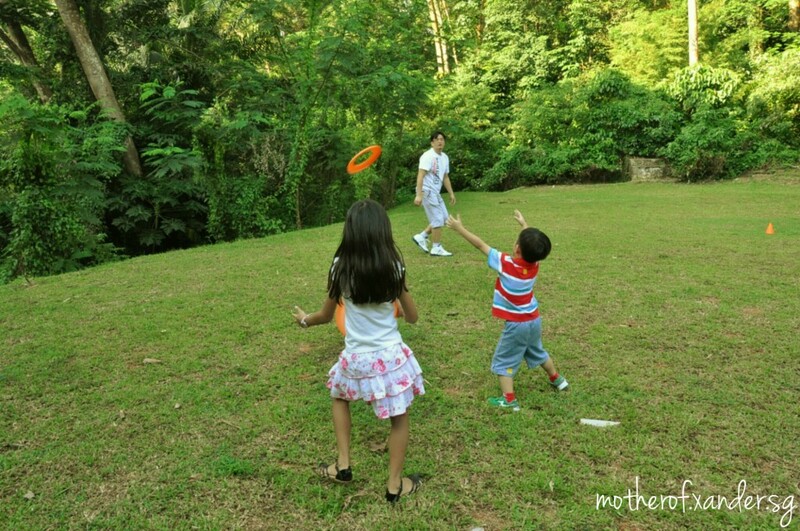 Needless to say, that day my heart stopped a few times while The Husband was playing frisbee with the kids. Maybe in future, the organizers should do something to it but in the meantime, exercise caution and please keep a close eye on your kids. When the dinner crowd picks up, the staff will be too busy to keep an eye on them for you. My verdict? I would go back for sure. The food was really good, I no bluff you. 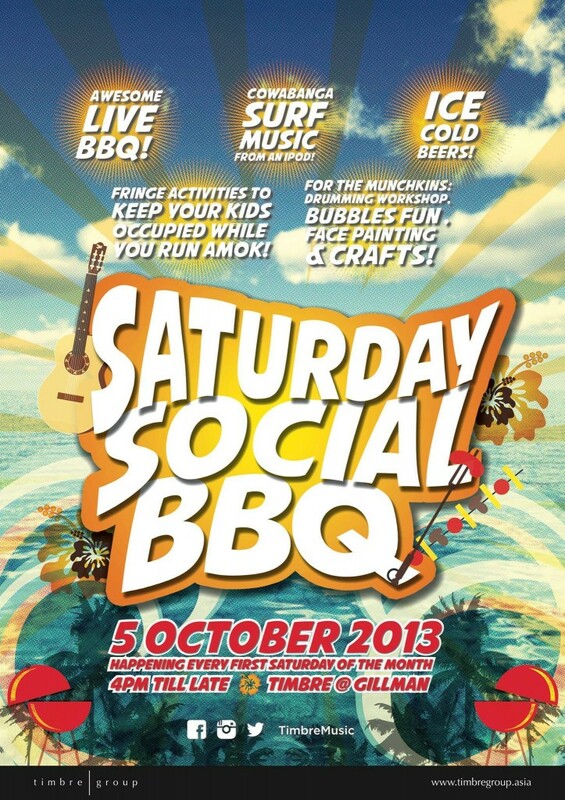 Just bring your mozzie gear and don’t get too wasted on the beer if you intend to bring your kids along. Here’s a sample of what was offered in October. The next one is tomorrow, 2 November!